The Latin Percussion LP1208-K Stealth Jam Block comes complete with a mount bracket for instant, easy installation into your percussion set .. 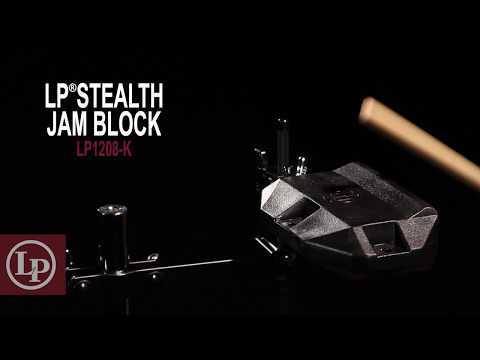 The Latin Percussion LP1208-K Stealth Jam Block comes complete with a mount bracket for instant, easy installation into your percussion set up. Offering life-long durability and medium-pitched tone, this LP Jam Block provides a great way to incorporate a new sound into your kit playing. Featuring a stealthy black colour, this LP jam block produces a strong medium pitched sound to add a blast of creative tone to your drum kit playing. Crafted from LP’s exclusive plastic formulation Jenigor material, this jam block has been created to be indestructible. Offering a rich, cutting tone, this jam block comes complete with a heavy-duty mounting bracket for easy placement within your percussion set up. The mount fits 3/8” diameter rods and features an LP eye-bolt assembly for a solidly secure attachment. For indestructible construction, strong cutting tone and secure mounting, grab the Latin Percussion Stealth Jam Block today from PMT Online.